The AMS has now received 1489 reports which makes this event the most widely reported fireball occurrence since the fireball list was resurrected back in 2005. Witnessed described a fireball as bright as the Sun that fragmented into many parts occurring near 5:45pm CST on Thursday evening December 26th. Several witnesses reported sonic effects associated with the meteors including at least three reports of delayed booms. If you saw this meteor please fill out an official fireball report here. Meteor over North Liberty from City of North Liberty on Vimeo. I have a very short video of the Meteor that crossed the missourisky yes terday evening about 545pm missouri time. I was traveling due North and I spotted it coming just out of the Eastern sky streaking towards the west. I have a cheap Chinese dashboard cam. The date and time stamp is not correct, but I assure you, it’s real. I bought this camera after the chelyabinsk event earlier this year. I finally have something to show for all my waiting. By the way, my location in relation to what I saw and captured, is approximately 7 miles west of plattsburg Missouri. Traveling North on Mo. 169 towards Grayson missouri, a very small community situated near plattsburg Missouri. John I seen it too I was traveling north on I 35 about a mile south of Kearney Mo. It was green and then it looked like it exploded into tiny pieces. It was traveling east to west kind of following MO rte 92. It appeared to be a very bright blue light. I thought at first it was a blown transformer, but no sound. I was traveling north into Franklin Iowa at about 5:40 PM. I saw the huge green glowing ball travel from east to west before exploding. It was incredible. My husband and I saw it. We live close to Bradford, IA (between Hampton and Iowa Falls, south of Iowa Hwy 3 and north of US 20). We saw it looking north. It went from east to west. I was 2 miles north of the Iowa border on I-35. It was cloudy there but all of a sudden, there were several bright flashes like lightening that quickly turned to green in color illuminating the clouds all over the sky. I couldn’t see the actual meteor because of the clouds but the clouds were totally illuminated whitish/blue initially but quickly turned green. It was rather eery until I heard about the meteor. I wish I could have seen the actual meteor. We saw it while driving north out of Roland, IA. It was a spectacular sight, and I’m glad I got to see it! Your trajectory is way off. I saw this on hwy 18 near Hartley, and it was still slightly north of me at the start, slightly further north at the break up. Either way was fun to watch it do it’s thing, was just hoping for more accurate information here. Appreciate your trajectory comment, and also believe your comment makes more sence to me. Do you have knowledge of other witness(s) as north or more north (NW) of Hartley? If you or they did not report the fireball to American Meteor Society, will you and they? 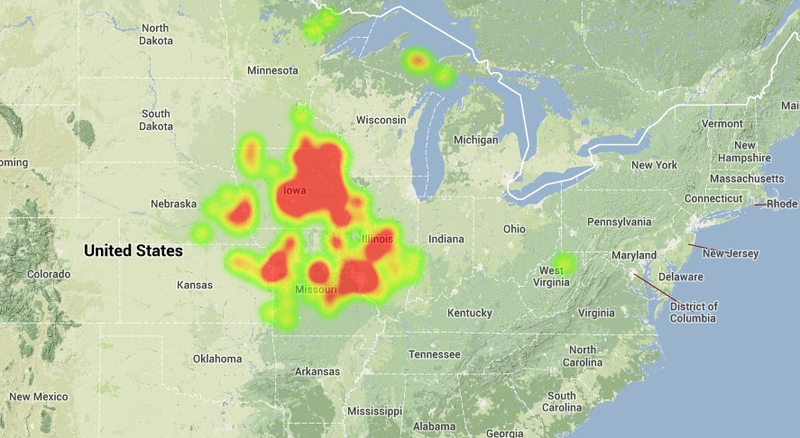 google fireball reports and file and official report. Good data from the very north west region of this massive fireball’s terminus is still needed for science. Security and dashcam videos are still needed from very north in Iowa or Minnesota, NS & SD for that matter. I know this has been a while, but was reminded of this event. We were traveling home that night on Iowa state highway 9 just east of Forest City and west of Fertile. It was cloudy that night. Initially we saw what looked like lightning flashes ahead of us, but just after I could see the fragments through the clouds almost immediately overhead. They past just slightly north of us (if straight above us would have been 12 on a clock, they were at 11 to 11:30 on the dial), almost straight east to west. Awesome sight. I was heading south along the Mississippi River around Minneiska, MN, when I saw several blue flashes in the sky over the bluffs to the west. As it was snowing, I first thought it might have been a plow truck’s lights, but it was far too bright and irregular for that. This is my third fireball sighting in the past three years. I saw it from my living room in Burlington, Iowa. It was a low, fast moving green flash that went across the sky in a straight line. I too reported this sighting from western Iowa. It was dark here at 5:44 p.m. (out in the country) and I saw a large ball of green with a red, fragmented tail. I saw it in SW Iowa, south of Atlantic/east of Griswold, as well as several others in the area at about 5:40. It was visible for 5-7 seconds and appeared to be traveling more of a horizontal path. It was a very bright blue light, but I heard no sound. We saw two flashes in the sky as we were driving east in Rochester, Minnesota. Thought it was lightning. It was an overcast night so we did not see the fireball. I saw the flash as I was driving west on U.S. 14 between Rochester MN and Byron MN.about 5:40 PM There was a large blue flash then a very quick smaller flicker like lightening. It lite the sky all around but seemed to come from the south east. I was driving north out of Mabel MN when I saw the flashes in the sky, and could not figure out what had happened, as there was a low cloud cover all I saw was the flashes, and the flashes seemed like lightning except one flash was greenish. When I got home about 3 minutes later, and got out of the truck, there was a strong sulfur smell in the air, like someone had been shooting off fireworks. So that is what I thought had happened, my son came home about 15 min later, and he said he had seen the same thing. I live in Iowa and i seen it while i was at work. My 16 year old boys saw it while bringing in wood. They thought it was an airplane going down. They said it was huge and really low in the sky, traveling east to west. We live in Moundville, MO, just south of Kansas City. We saw two tonight as we are driving from St. Louis, MO, to northern IA anf wondered what was happening. The first was on the IA/MO border near Keokuk. That looked like an oddly-behaved, overly bright falling star. The second was south of Waterloo, IA and looked like a huge green (orange trail) firework falling toward the ground although it was not. I was traveling north on US 61about 4 or 5 miles north of Burlington Iowa and watched it for probably 6 to 8 seconds. It was flying east to west about 30° in the sky and first appeared white and began to change a brilliant green about halfway through my observation and had a long tail which consisted of yellow fragmentation. Unfortunately no explosion and quickly burned out. An truly awesome experience! My family was traveling back to Iowa from Missouri on Highway 61/27(Avenue of the Saints). We had just crossed into Iowa when it appeared on the Eastern side of the road, going westward. It seemed to only be a few car lengths in front of us and didn’t seem to be very much higher in the air than the power lines along the road. It was glowing white with a tail as it passed over, then seemed to turn a greenish color and burn out just before it would’ve hit the ground. 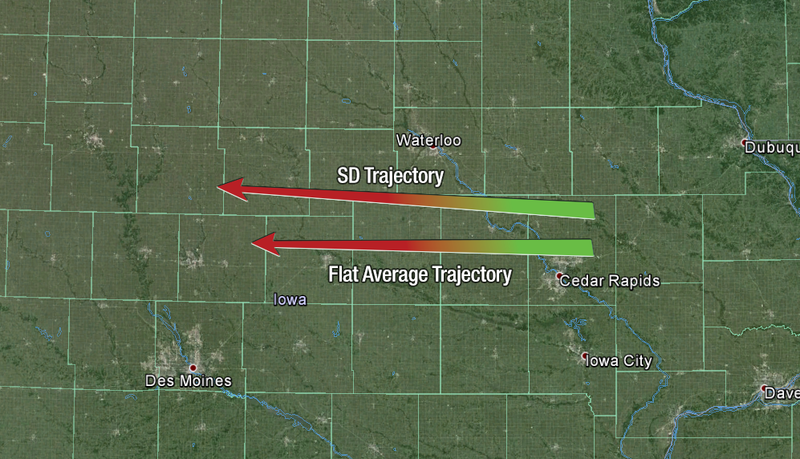 I saw a large Greenish flash over Cresco, Iowa that night about 5:40. At first I thought it was the Northern Lights or Lightning. I thin thought it might be a failing power line. I heard about the Meteor on KWWL 10 o’clock news. I was traveling on hwy 169 north, I was about 2 miles south of Smithville MO. When I seen the bright green fireball traveling east to west. We were heading home to Rochester MN when we saw a bluish-green flash of light spread over the sky. After about a two second flash we waited for another. Nothing. We felt like we were in a science fiction movie wondering who was taking over the earth! How awesome to know what really happened! We were in Rochester Minnesota NW area and we saw the sky light up. We didn’t know what it was, thought it must have been lightning. We laughed and said maybe there will be an article in the paper about it. Ended up to be on the front page of the Rochester paper!!! We were driving north on I35 out of Missouri, just crossed the Iowa Border nearing Des Moines and saw the fireball — Blue, and green light… and orange and reds as it flared off and on. Saw it for about 8 seconds I believe. Love these things. Last night I had a bunch of friends posting on face book that this same thing happened. It was about 10:15pm here in Brainerd, MN when they all heard the boom and say the light. I heard this boom also around 10:15 in Baxter, MN. I didn’t anything but sound was scary, I was sure it wasn’t fireworks or a gun. It sounded more like a bomb or thunder. Seemed to resinate from the north west of where I was. Felt the house shake/others felt building or houses shake also around the same time in Brainerd. The times for this or these events was weird. I can relate to the brainerd mn sightings. I was driving nw on 94 westbound to saint cloud. AT around 10:15 pm i seen the object come in from south to north towards brainerd area. couple of flashes that light up the sky then burned out. Then when i go looking for other sighings they said it was in iowa moving east to west. THis must be multiple events, wtf is goin on ? I heard it to. from Brainerd Minnesota…. we saw it all the was in Basehor, Kansas!! It was quite a site to see. my boyfriend ,sister & myself seen it approx. 5:30-6:00 pm near Missouri Valley IA. It looked like a ball of fire with a green tail trailing then it faded and was gone. Also was seen around 5:40 in St. Lucas Iowa. At first we thought ti was lightning but there was a bluish color to the flash. We were traveling south on I-35 in northern Iowa near the Kensett, IA exit when I saw the flashes. The first flash grabbed my attention and I turned my head to the east and saw the rest of the flashes. I am certain that the flashes originated north and east of my location. Sighted in Ames, IA, approx 5:40pm Dec 26 while walking North at Ada Hayden Park. Fireball moving East to West, low in the sky, trajectory constant. Leading large mass bright neon green, smaller orange area at rear. Far, far, far brighter than the moon or Venus. Variable large trail of sparks following the main mass. Object entirely burned out while still in main trajectory. Amazing sighting! I saw it from my living room in Gardner, Kansas at 5:43 PM. I know the time because I had sent a text to my wife and daughter immediately after it happened. It was traveling to the NNWand broke into at least 4 or 5 large pieces as it flared out. Sometime after 10 pm Friday. Watched a large burning green fire ball slowly descend straight north of New Ulm MN. Estremely bright and seemed very close. I was traveling north on US 77 coming home from work in Lincoln to Wahoo, NE. Noticed the bright light to the ENE. Thought it was odd and rather bright but dismissed it as an airplane on approach to Omaha. We saw it! We were driving in eastern Fillmore County, Minnesota. We totally thought it was lighting. It was incredibly bright even though the sky was overcast. The trajectory seems wrong on the map. We were north of Waterloo, driving north, and the fireball was quite a bit north of us. I saw it from Pequot Lakes, Minneosta! I was working out in the yard. I also herd the big bang around midnight. On Friday, 12-27-13, at 10;30pm, I saw a bright, vivid blue fireball falling STRAIGHT down to the ground. It was falling like in slow motion. It looked like the size of a basketball and had landed about a block away. I know it had to bee further away, it throws off your depth perception because to everyone it looks like it was “right there”. My neighbor also saw it. I live in New Richmond, WI. We saw a very bright light moving mosly horitzonal E to W as we turned to go north on Maple Street in Sidney, Ia. The trees blocked a good view of the trajectory but we did get 2 glimples of it. By the time we hit a clearing with it was gone. I HEARD 2 BOOMS AND I LIVE IN FLORIDA!!! Your booms are unrelated to this event. It was around 5:35 pm on Dec 26th. I was on archor st. headed North toward Highway J-20. which is 15 miles north of Clarinda Ia. I saw a Blueish-Green and yellow light coming out of the East. and also later that nite at around 8:45 I saw another one, but not as big as the first coming out of the South this time. I was heading South on Hackaberry road towards Coin Ia. Also saw another one on Dec 27th at around 10:20 pm out of the South on Hackaberry road going towards Coin Ia. I live in Le Mars Iowa. We saw the meteor Friday night around 10:15 pm as we were traveling north towards Le Mars. It started small and moved very slow then suddenly became much bigger for roughly 1-3 seconds before it exploded and looked as if it split into three segments then quickly disappeared. Very cool, and had me wondering all night if I could find fragments, but they were more than likely many miles away and merely dust particles by time it broke through the atmosphere. On Friday December 27th sometime after 10pm I heard an incredibly loud boom and my house literally shook (I live in a triplex condo) in Brainerd, MN. Sounded like a crack of lightning had touched down on the north side of my house. Had no idea what it was, until I heard reports of a meteor in the days to follow. My parents also felt and heard the boom, and they live 10 minutes west of me in Baxter, MN. Jenny, I’m glad someone else saw the Friday night December 27th fireball flash as well. We were driving up to Bemidji on US-10 just south of Motley,MN. At 10:23pm about 5 miles south of Motley the sky flashed with crazy brilliance for about 5 to 10 seconds. Since I’m an astronomer my first thought was a fireball caused by a meteor (I always record the exact time when I see things like that). Unfortunately, it was overcast. All 4 passengers saw the very same and we all looked for it to come through the clouds or for a loud sonic boom. However, we didn’t see or hear anything. I do not believe it was lightning or ground flashes based on the duration and the sky brightness. This was confusing since the other sightings were on December 26th. I’m sure many others in MN saw this. What I’m not able to ascertain is just what direction it was going – would be great to hear from others in MN of what they saw. Had just come off Hwy 52 (was heading south), took the 19th street exit and was near Assissi Heights in Rochester, MN. ( I had run errands, it was 5:22-5:39 ish.) There were clouds, and they appeared to light up in a wave. I thought it was lightening across the sky, on the west side of the car was Gloria Dei Church, to the east -Not sure purplish, then a few seconds later greenish coloration, no thunder. I thought to myself, “oh, I wish I had my camera!” Then I thought, to myself, “You can hardly photo a flying bird, how would you have had time to catch that?” Kept watching the sky, twice, hum. Car Dealership ? Naw…Superman ? naw…saw on the news, it was a meteor. Friend sent me this, glad everyone is safe. I saw it. I was just went of Albert Lea driving on I90. I also thought it was lightening but it was so much brighter. My family and I saw it at 5:41 pm, December 26, 2013. We were traveling North on the Dieterich Blacktop just South of Dieterich, IL. It was bright green, moving from East to West. It broke up into several pieces as it went out of sight to the West. I don’t suppose there is a way to report a sound only event? I didn’t see the fireball, but there was a very pronounced sonic boom here in Bloomington, IN at 6:47 pm (ET). Based on some twitter reports, it was heard/felt in different parts of the city. The AMS accepts sound only fireball reports. Simply fill out the applicable areas of the fireball report and include in the notes that you did not actually witness the fireball. My husband and I were standing in our driveway 4 miles east of Crete, NE (about 10 miles sw on Lincoln) right off Hyw 33 at about 5:45 when we both saw a very bright burning object. Our first impression was that it was a small plane on fire, but it was way too intense for that. It was like looking at the sun with fire and explosions. We thought it was moving north, but it only lasted a couple of seconds. We thought it burned up. I saw it! I was in Exira, IA. The patio door curtains were open and for some reason I looked up and outside and THERE IT WAS! It was a green glowing light moving from east to west as it went downward. As I saw it it was green, orange, yellow, then white and out of sight. I am glad I experienced this! I saw this driving in Ames Iowa, I couldn’t believe how bright and close it seemed.